Tire pressure loss is a serious problem and causes accidents which can result in catastrophic failure and blow out a tire, in turn costs thousands to repair. That’s why we have this system to monitor up to 22 tires and it’s a simple WIRELESS system that installs in minutes. You just screw on a Sensor onto every tire in place of its current screw cap, and then turn on the wireless receiver. After a few clicks you will see a bright display that will show you all the information you need to drive down the road. You will see all current tire pressures as well as tire temperatures. This will allow for a safe drive with peace of mind. This system comes with 4 sensors included. You can add sensors as needed to this system using the product options. Feel free to call us with any questions. You are going to be the best battery life and quality when buying from TadiBrothers. The battery is made by Panasonic so it lasts and lasts, and the internal chip is made by GE. 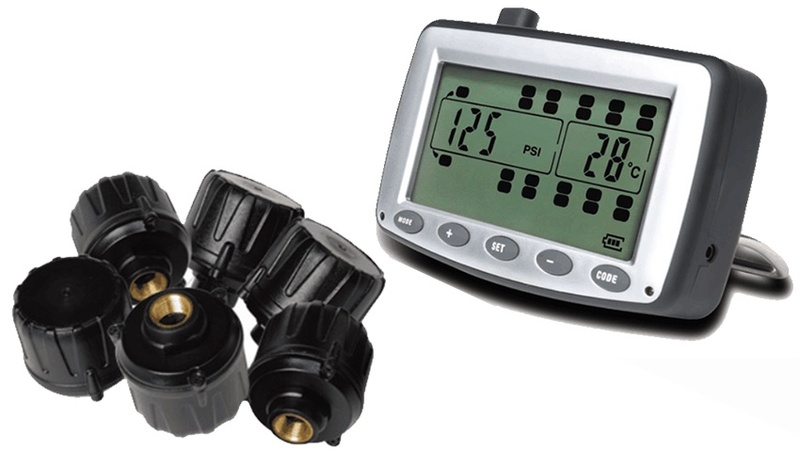 The system can also be setup to have alerts so you are notified with an audible beep if the pressure drops below your specs, and also alerts when temperatures rise to high. The wireless transmitter, which has several mounting options, will run for up to 30 days with a full charge(cigarette adapter included) and the sensors have little button batteries that are easily replaced. You can also securely lock in these sensors onto the tires with a lock we provide in each kit. We also sell a repeater to be used in cases of interference. You may want to consider one if you are beyond 70ft. This can always be added later.